Abstract - Lawful Interception is a very basic method used by the law enforcement agency (LEA) all over the world for identifying criminal act and actors by monitoring telecommunication network. It plays an important role for the homeland security. As soon as the VoIP is introduced, people switches from traditional telephone system to VoIP due to higher speeds, low cost, support for mobility, and easy nature for encryption. But there are some issues such as misuse of intercepted data by the members of LEA, privacy concern of the individuals, cost, legal liabilities, etc. On the other hand, VoIP has become a popular means of communication tool for the criminals and terrorists – as VoIP provides secure conversation by encrypting the messages transferred between two communication parties. Besides other difficulties for interception cause due to the architecture of the VoIP and use of smart devices – thus it is hard to intercept both the signaling and call contents . This paper presents a Trusted Third Party (TTP) or Key Escrow Agent based Lawful Interception (LI) model that would provide lawful interception over VoIP while ensuring the individual privacy. Abstract - Critical crime investigations require transmitting sensitive criminal photographs across internet or by mobile phones. Transmission of such image data demands high and guaranteed security. The aim of this paper is to present multilayer, secured, robust criminal photograph authentication scheme based on Harries corner detection technique, YCgCb, LUV color spaces, wavelet domain and Arnold Transform. Harries Corner detection technique is used to generate key K which is further used to scramble watermark by Arnold transform. Discrete Wavelet Transform (DWT) decomposition is carried by simple, orthogonal wavelet, ‘Haar’. The direct flexing factor K1 is used during embedding and extraction process. This technique gives maximum PSNR 54.32 and Normalized Correlation (NC) exactly 1 reflecting effectiveness and accuracy of the scheme. It is robust against various attacks like filtering, scaling, compression, rotation, resizing etc. Abstract - The available literatures on image processing in agriculture application under high performance computing (HPC) are limited and sometimes are not discussed in details. This paper reviewed the steps of image analysis done in some image processing focusing on agriculture application and also the details analysis of parallel and distributed image processing. The memory architecture in parallel and distributed image processing and some suitable application programming interface (API) in parallel and distributed image processing are examined. In general, this study provides basic understanding of parallel and distributed image processing for agriculture application. Abstract - Pattern Recognition has attracted the attention of researchers in last few decades as a machine learning approach due to its wide spread application areas. The application area includes medicine, communications, automations, military intelligence, data mining, bioinformatics, document classification, speech recognition, business and many others. In this review paper various approaches of Pattern Recognition have been presented and their pros-cons, application specific paradigm has been shown. On the basis of survey, pattern recognition techniques can be categorized into six parts. These include Statistical Techniques, Structural Techniques, Template Matching, Neural Network Approach, Fuzzy Model and Hybrid Models. Abstract - The up-gradation of an Electrical power generation network results in higher levels of short circuit fault current. Thereby, the existing protection equipment like circuit breakers, isolators and fuses become under capacity and not capable of withstanding higher short circuit currents. Thus the system is highly vulnerable to the adverse effects of short circuits. Replacing the whole protection switchgear is not feasible technically and economically. The solution in such a situation is an equipment called Fault Current Limiter (FCL). The concept of FCL is not new but the most suitable FCL is an on going research subject. This paper covers the prevailing aspects of FCL, the types of FCL, the research progress and at present the most viable FCL solution for industrial purpose at 6.3kV system in Pakistan. Abstract - In this paper we are dealing with some basic class of graphs that give a DFS tree which is a path consisting of all the vertices of the graph. Some of the graph classes result in DFST (G) = Pn after applying some conditions and by giving proper labelling of vertices. The DFS algorithm has to be modified accordingly. We want to generate a Pn by applying DFS on the given graph G. We developed the algorithm with time complexity of O(n2). Abstract - Evolutionary Algorithms (EAs) represent an elegant class of solution paradigms that can efficiently tackle NP-hard problems such as network design problems. The most widely used of these EAs is genetic algorithm (GA). However, GA is prone to premature convergence making it unable to search numerous solutions of the problem domain. A memetic algorithm (MA) which is a symbiosis of GA and local search technique is an effective option for reducing the likelihood of premature convergence. 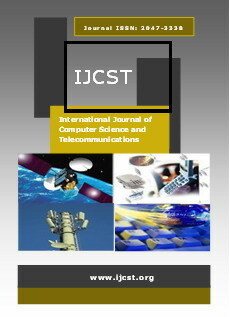 This paper proposes a MA-based approach for multi-objective design of communication networks. To be able to estimate the quality and cost (in computation time) of obtained MA solutions, we design a GA and use it to equally solve the problem. Our computational experiments show that MA is superior to GA in solution quality but inferior to GA in computational time. However, for 36-node network (large network), MA is able to find solutions (though not best) that are better both in quality and cost than the best GA solution. Abstract - The development of mobile communication and hand-held device offers new and innovative pedagogical approach in the learning system. The M-learning approach offers an anytime, anywhere learning scenario to the learners through mobile devices. Sentiment Analysis is the area where the user’s reviews or opinions about the products are analyzed. Analyzing the opinion or sentiment available online gives significant amount of information about the product, through which a person or a company can gauge the product quality and its status in the market. This paper analyzes the sentiments about the M-learning system and also investigates the classification accuracy of Naïve Bayes algorithm. The accuracy of the Naïve Bayes algorithm is compared with random forest data mining algorithm and K nearest neighbor (KNN) algorithm for opinion mining and in specific for M learning systems. Abstract - No doubt, our modern society is gradually catching the cashless syndrome. E-payments, ATM cards and others are now the order of the day at our work-places. This paper takes a keen look into the feasibility of introducing cashless means of business transactions into our society and the security threats associated with it. The paper explains the potentials of applying data mining techniques to effectively control the security threats and finally presents a model for knowledge extraction in a cashless environment. Abstract - Recent advances in hardware technology have increased storage and recording capability with regard to personal data on individuals. This has created fears that such data could be misused. To alleviate such concerns, data was anonymized and many techniques were recently proposed on performing data mining tasks in ways which ensured privacy. Anonymization techniques were drawn from a variety of related topics like data mining, cryptography and information hiding. Data is anoymized through methods like randomization, k-anonymous, l-diversity. Several privacy preserving data mining algorithms are available in literature. This paper investigates the classification accuracy of the data with and without k-anonymization to compare the efficiency of privacy preserving mining. The classification accuracy is evaluated using k nearest neighbor, J48 and Bagging.